Royal Canin Maxi Baby Dog Ultra Sensible is ideal as a first feed for maxi dogs (adult weight 26kg – 45kg) from weaning to 5 months old. 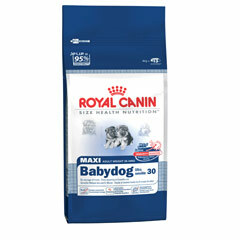 It is easily digestible and contains essential nutrients that a puppy needs in the first months of its young life. It can also be moistened (re-hydrated) to make it easier to chew.